I knew what to expect last week when they dropped off Hyundai’s new Genesis luxury sedan. Ever since the Genesis line was announced, they’ve been touting how the car in on-par with Lexus and Mercedes at a much lower price point. But when the car actually pulled up into the driveway, it was still hard to believe I was looking at a Hyundai. 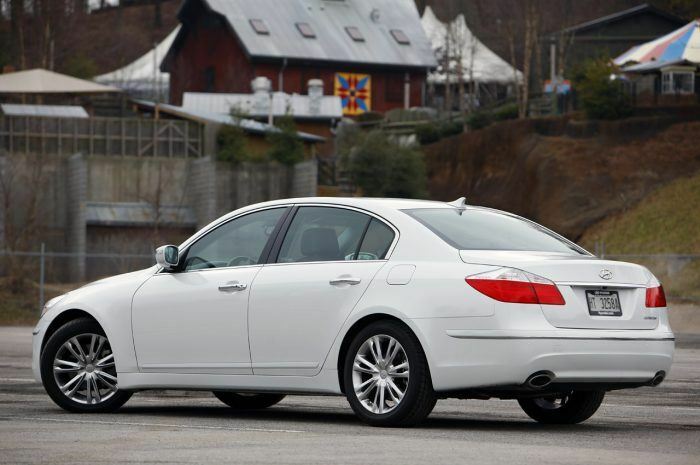 The car is most often confused with a Lexus (this happened multiple times,) but also has hints of Mercedes, BMW, and even the ultra-premium Maybach luxury sedan. 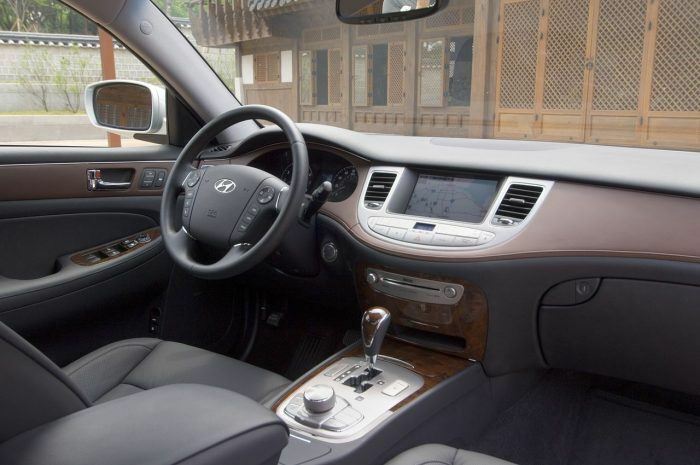 You can get the Hyundai Genesis Sedan in two engines – a 290 hp 3.8-liter V6 (which I assume would be perfectly adequate,) or an excellent 4.6-liter 375 hp V8. We only get one transmission choice with the Genesis, which is a good mate for this car – a 6-speed automatic with Shiftronic. The car we got was a fully loaded model, which had the excellent 4.6-liter 375 hp V8 engine, and included the only option available – the Technology Package. This $4,000 option includes a 528-watt Lexicon audio system with 17 speakers (whoa,) and 7.1 surround sound, 40 GB hard drive-based navigation system with in-dash 6-disc DVD, rear back-up camera, driver information system, adaptive HID auto-leveling headlights (the ones that pivot when you turn a corner,) front and rear parking assist radar, and a cooled driver’s seat. That’s a lot of stuff for $4,000; typically a nav system alone will add $2,000. Amazingly, a lot of what would normally be an option comes standard on the Genesis 4.6 – Automatic headlights, power heated and auto-dimming side mirrors, premium leather seating with heated seats, leather-wrapped door and dash trim inserts, power tilt & telescopic steering column, cruise control, proximity entry with push-button start (meaning you never have to actually touch the key,) wood & leather steering wheel, power rear sunshade, rain-sensing wipers w/auto defogger windshield, two-zone front auto climate control, electrochromic rear-view mirror, USB and aux audio input, Bluetooth, 18-inch alloy wheels, and a Lexicon 14-speaker surround sound 6-disc audio system. Whew! In other words, it’s perfectly OK to order the car without any options – it’s a luxury car from the start so it doesn’t skimp on the features. For safety, we get ABS, Traction Control, Stability Control; front, front and rear seat-mounted side, and roof-mounted side curtain airbags. All standard of course. See above. The fact that so much equipment comes standard on a car that starts in the low-$30K’s is amazing, and a Technology Package that includes as much as it does at only $4,000? We’re off to a very good start before we even drive the car. Thankfully, the Genesis doesn’t disappoint there either. Starting from the beginning, both front and rear passengers and driver have more than enough room at any height, and the leather interior is of very high quality. The driver’s seat heats and cools your heiney with three different intensities, the LED interior lighting illuminates the interior with cleaner white light than your typical incandescent yellow bulb, and the steering column moves up & down and in & out with one power switch. Start the engine with the push-button start, throw it into reverse, and on comes the rear back-up camera get too close to something and the system will let you know. While in reverse, the side mirrors automatically move downward to help your field of vision while reversing, and then move back once you’re in drive. 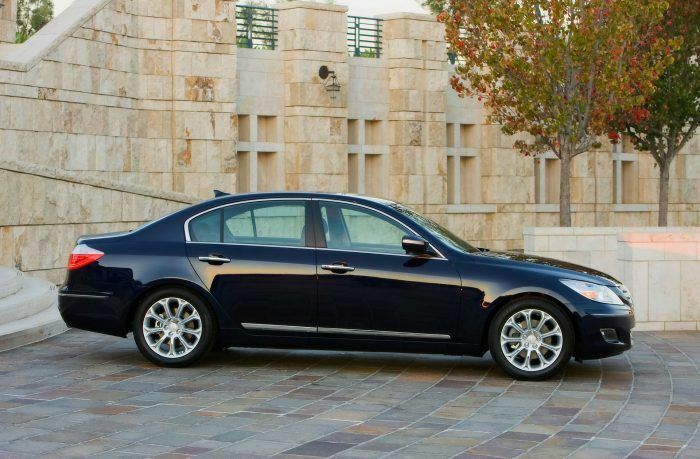 Driving the Genesis is what you would expect from a luxury sedan. All movements are smooth. Shifts are barely noticeable, steering is even and mild, suspension is soft, and acceleration – while a powerful engine – swells instead of jerking you back into your seat. While the suspension is soft and smooth, don’t expect to confuse it with a Mercedes-Benz that costs twice the price. It may be close, but let’s be reasonable. Steering is smooth and precise with very little body roll. Seating is more than comfortable all-around, as the seats let you sink into them like a sofa. The car is very attractive inside and out, and only one person I spoke with didn’t like how the exterior looked. She said it looks like it’s trying too hard to clone the looks of other luxury brands. Bits of Mercedes, pieces from BMW, and parts from Lexus. A valid point, but an attractive design overall which you will never mistake as anything but a luxury sedan. Interior design is also very attractive with LEDs, soft glowing, and electroluminescent gauges. The center console and dash are smooth and flowing and controls are generally easy to figure out. Hyundai seems to be taking over the controls from BMW’s iDrive and Audi’s MMI system, with one large knob that controls the whole system. It does a fairly good job at everything, but could use a bit of work on the interface navigation. A few other quick notes about the many things I like on the Genesis – you can use the GPS while moving unlike many other systems, which don’t consider that you might have a passenger with you. I wouldn’t buy a car with a nav system that locks you out while moving, so I commend Hyundai on this. The interior trim, fit and finish is excellent, and belongs in a much more expensive car. Standard iPod connectivity (even though it didn’t work right) and audio connectors (USB and aux) are great to have, and the sound system is very good. Power from either engine is very good for its class, and if you can afford the V8, go for it. You’re getting an expensive engine in a luxury car for a bargain. Lastly, I’m very happy Hyundai went with a rear-wheel-drive layout for the Genesis, although an AWD option would be nice in a future model. I could clamor on all day about how good this car is, but suffice it to say that it exceeds expectations. Let’s get to what isn’t so great about the car. To be honest, I really had to think about this for a while, but I did find a few details that should be fixed for the 2010 model. First, the rear seats don’t fold down. The trunk is large enough for most, but folding rear seats would create extra cargo room for longer objects which might not fit through the small pass-through. Also, there are a couple minor features that are standard in other cars in this price range which are absent in the Genesis, such as a lane change blinker (blinks 3 times then stops when pressed slightly,) and speed-sensitive volume control (audio volume increases proportionately with speed to compensate for road and wind noise.) I would also like to see the design of the steering wheel controls smoothed out – it’s a bit cluttered as-is. Lastly, I did have a problem with the USB connector – it freaked out when I connected my iPhone, didn’t recognize it, and made the iPhone think I was plugging and unplugging it twice a second until I took the connector out. So despite the iPod integration, it doesn’t support the iPhone via USB. You can, however still use the standard auxiliary jack for any MP3 player, including the iPhone. Laugh in the face at those who can’t look past the Hyundai badge – you’re a savvy shopper who doesn’t care about no high-falutin’ brand name, but about what you get for your money. We got an average of 23.3 mpg from our V8 model. 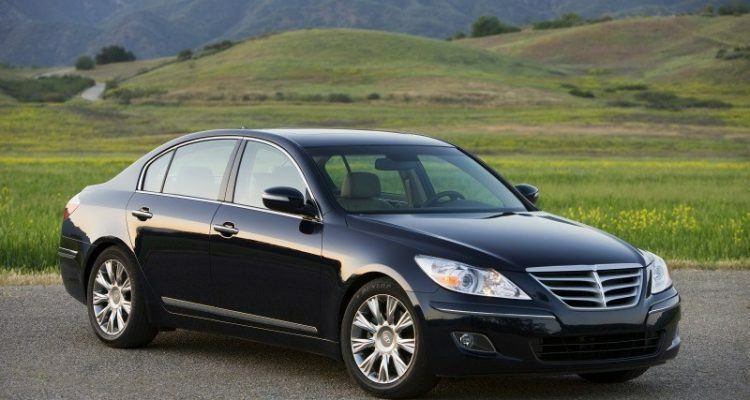 If you’re looking to buy an entry level luxury sedan and you don’t look at the Hyundai Genesis, shame on you. It may have a Hyundai logo on the back of it, which used to mean undesirable and boring, but not anymore. 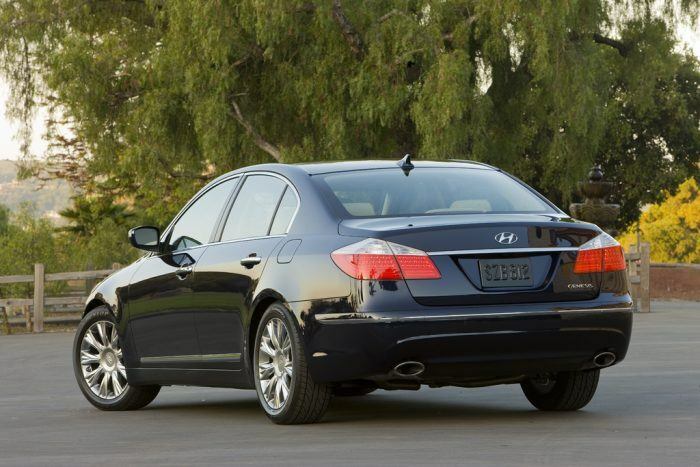 Hyundai has reinvented themselves in the past few years, and they’ve sealed it with the Genesis. Probably the best bang for the buck on the market right now if you’re looking for a luxury car. 13 Comments on "2009 Hyundai Genesis Sedan Review"
While I agree that a folding rear seat would be nice, you won't find one in any luxury sedan from Japan, either. Oddly, this is one area where they didn't copy the Germans. Hi Michael. You're right about the rear folding seats not being in other asian cars either, but to be honest I had to stretch a bit to find something wrong about the Genesis so I had to nit-pick a bit. In my opinion, they've made an almost perfect entry-level luxury sedan. My friend says on his brother's hyundai, an iphone works only if you use the original apple usb cable. I'm quite interested in the genesis and saving every buck to get one, but one thing is really bugging me: how's it gonna be like after say, two years from the day of purchase? Lexus has built a very solid reputation regarding service and durability with their cars topping 200,000 miles with out the slightest problem. I wonder whether or not the Genesis will remain truthful to the merits and standards it was built upon. Alawi–it's too soon to tell, of course. 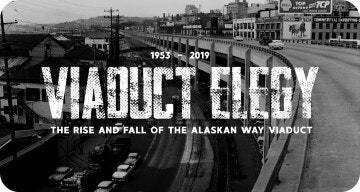 But my site, TrueDelta.com, is tracking these cars closely as they age. We're the only ones with reliability stats on the Genesis, and we'll be updating these again in May, and then every three months after that. I can't say of course how the car will fare in the next few years, but I can say with confidence that the Genesis I drove felt very well-built, had a very tight fit & finish, and felt solid all-around. Hyundai also has an excellent warranty, so you shouldn't have to worry about anything for while. Hi Alawi, Hyundai has a great warranty when compare to other company. You can go with powertrain warranty for 10yrs/100000 miles. They even fix something that not cover in the warranty policy. You can't go wrong with Hyundai warranty and I can tell that their reliable is the same as Honda. The Genesis is astounding. My nitpick issue, at least with the coupe, is that the steering wheel mounted volume controls, seriously lag when utilized. It takes almost 5 secs at least, to start moving, either up or down. The ride on the track model is way too stiff also, but of course, this was the sedan you tested. Do any of these, however, ring true for the sedan? Hey Timi, no I didn't have any problems with the sedan as far as lag with the steering wheel controls. Interesting that's an issue on the coupe – maybe that's something that's wrong with that car in particular. The ride on the Track model is supposed to be tight with the track-tuned suspension, but hopefully not bad enough to make it an unpleasant daily driver? Overall the car is pretty good. But, a continuing problem with audio system. Hyndai has replaced it once already but once in a while the sound goes out. I understand that it may have something to do with the Bluetooth. Today, the sound went out, a message shows up on the screen,…Check Antenna… Screen indicates recognition that FM station and XM exists, but no sound and cannot switch channels from steering column or to AM. Anyone else? Bella davvero la Hyundai Genesis Sedan! Peccato che da noi in Europa, in Italia in particolare, non arriverà mai! Con almeno un buon diesel, sarebbe una valida antagonista soprattutto della Infiniti M30d, ma anche della migliore concorrenza, rivolta a chi è stanco delle solite belle e perfette tedesche! Mi rendo conto che il brand Hyundai in Europa è ancora impreparato per questo segmento di mercato, ma resto ugualmente convinto (e affascinato) di questa idea.